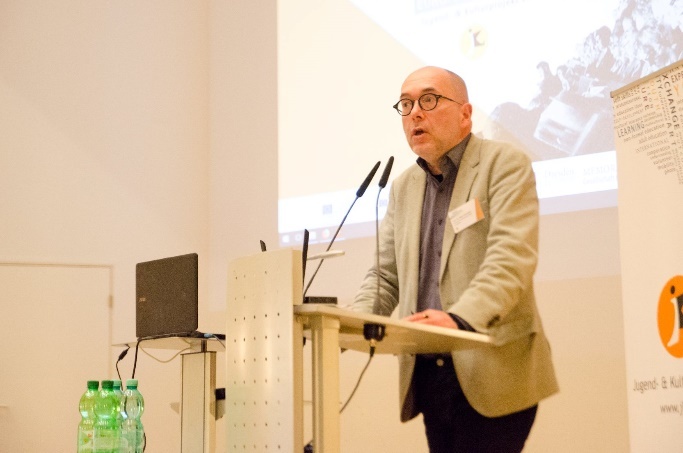 RECONN arose from identification of the dangers of citizens’ disengagement with the EU public sphere in these challenging times for Europe when xenophobia, intolerance and discrimination are arising. The project brings together 5 countries (Germany, Czech Republic, Greece, Hungary and Poland) and 7 partners committed to reconnect their constituencies with the European project and its founding values. The aim of RECONN is to help communities involved discuss the Future of Europe, increase awareness about the rationale behind the European integration process and promote stronger participation in the European Elections in June 2019.
from the indigenous communities and outsiders. Then, working with representatives of the partners during RECONN strengthens the foundations for continued intercultural dialogue and increase of mutual understanding. The legacy of RECONN is an informal European transnational network of young activists, emerging leaders in their organizations, communities, municipalities, with ambitions to actively address the use of fear, populist language, fake information, prejudice and hatred, and to invite citizens to actively participate in the EU. 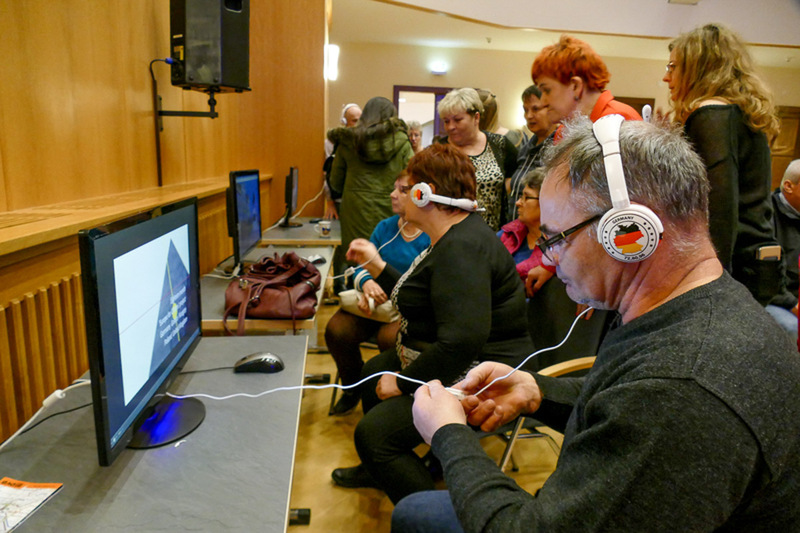 RECONN provides tools developed through other EU-funded projects such as educational videos and guidebooks that foster intercultural dialogue, mutual understanding and civic participation of Europeans and third-country nationals, and it will continue beyond the life of the project in an attempt to connect to a wider European community. RECONN envisages a major international event to promote tolerance, respect of common values and promote through counter narratives a more accurate perception of third-country nationals; All events will contribute to citizens’ understanding of the Union, its history and diversity and will trigger reflection upon the ideas of European citizenship, civic participation and democratic ownership at both local and Union level. From the start, presentations at the RECONN event will be formulated in a way that raising awareness of remembrance, common history and values and reinforcing the aims of the Union to promote peace and the well-being of its peoples will be reflected. The transnational workshop will encourage democratic and civic participation of citizens at EU level, by developing citizens’ understanding of the Union policy making-process and promoting opportunities for societal and intercultural engagement and volunteering at Union level. 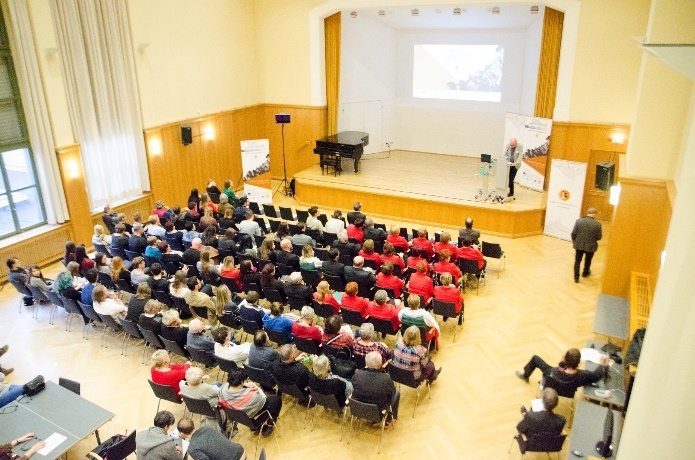 RECONN actively supports major EU initiatives such as the newly launched European Solidarity Corps and the designation of 2018 as the European Year of Cultural Heritage to give a shared sense of belonging to the EU. RECONN consortium members are aware that decisions and policies needed on issues ranging from economic growth, security and Europe’s role in the world should be taken and shaped with the citizens. Considering the European citizenship as an important element in strengthening and safeguarding the process of European integration, RECONN will encourage the engagement of European citizens in the life of their community, thus enabling them to participate in the construction of an ever closer Europe. RECONN actively seeks ways to foster civic participation, for example through encouraging citizens to join the local civil society organizations as volunteers and help maintain places of remembrance. Finally, the project seeks to add to the new narrative for Europe tools that will help municipalities, civil society organizations and citizens in the RECONN members (Dresden, Kistarcsa, Prague, Olesnica & Wroclaw, and Thessaloniki) to navigate intercultural and intergenerational dialogues, shape local policy to preserve and develop remembrance sites, valorize lessons learned, and make sure that Europe’s future is based on its core values and strengths. On 14th February 2018, Jugend- & Kulturprojekt e.V. in cooperation with Memorare Pacem e.V. 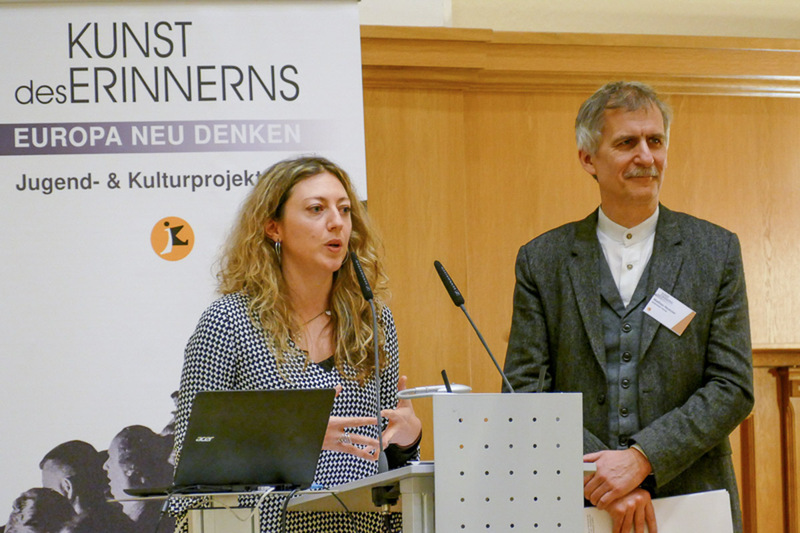 and the Municipality of Dresden, held the public event “KUNST des ERINNERNS – Europa Neu denken” – ‘The Art of Remembrance – Envisioning Europe’, at the Cultural Department of Dresden. v) information desks about volunteering and European Solidarity Corps and Best Practices and Tools to combating the stigmatization of “immigrants” and hate speech, as well as about the EU featuring publications such as “Guide to EU Institutions”, “Europe for You, for Your Rights” with support from Europe Direct. vi) A debate about European identity and what it means to be an active European citizen. – What does the EU mean to the individual citizens, how can citizens influence the policy-making processes? – Migration & Islam – threat or opportunity? After the debate, round-table discussions took place based on the questions raised during the debate. Choral Performances by two choirs; UNA VOCE choir and Jarzębina Wyszogrodzianie. The idea of the UNA VOCE choir, established in 2013, is incorporated in its name, which means “united voices”. The initial idea was to make a step beyond the folklore repertoire and to experiment with polyphonic songs. 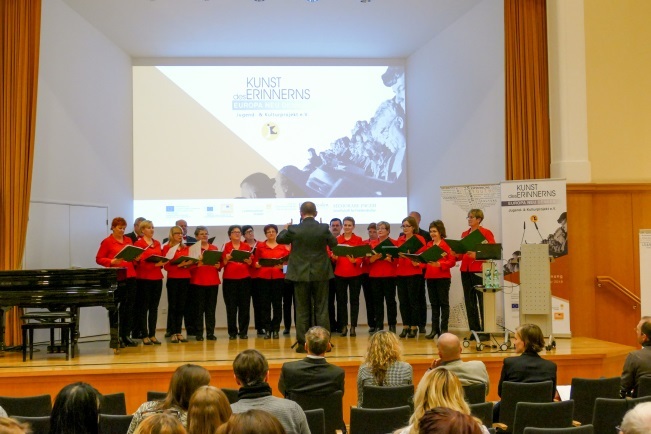 An important event for the UNA VOCE Choir was their participation in the “SINGING EUROPE” event in July 2016, an international meeting of choirs from all over the world, performing at the Municipal Stadium in Wrocław, organized by the National Forum of Music in Wrocław, as part of the European Capital of Culture Wrocław 2016. Zines are small handcrafted books that date back to the 18th century as a subgenre and were used as self-expression by socially disadvantaged groups, especially in the 1970s. A zine is a non – commercial, non-professional publication, a sort of magazine but with a twist. The main difference between a magazine and a zine is that zines are not out there to make a profit but, rather, to add other, often unheard voices into the mix. Zines are usually made out of interest and passion and are often self-published by the writer/artist/creator. Typically, zines are made using collage techniques and are then photocopied since these are means available to almost everyone. Zines are used as a storytelling method. 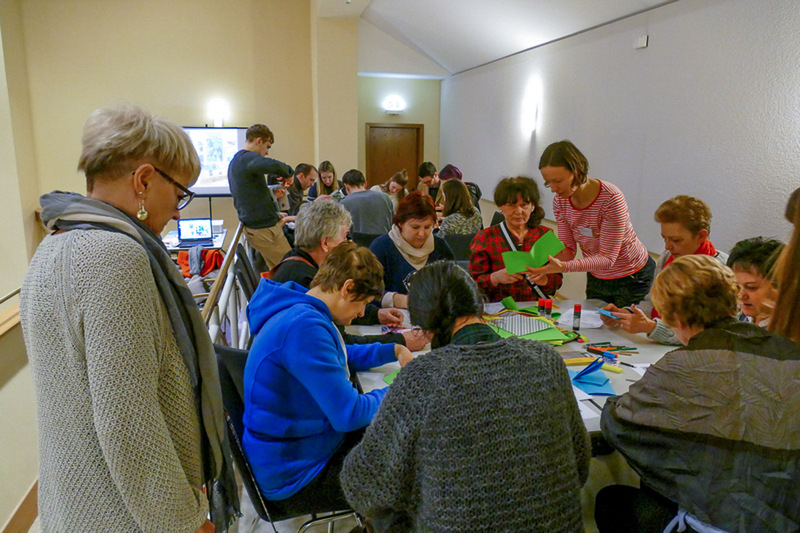 The workshop was coordinated in English and German by the German artist Stephanie Lüning (MA, Academy of Fine Arts Dresden), with all materials and tools provided free of charge. The instructions were also translated into Arabic, Czech and Polish. Video Interviews were screened, produced within the framework of the Europe for Citizens project “Bridging Generations” (2014-2016).